You may not realise it, but the pressure your skin is put under on a daily basis is tremendous. Air pollution, air conditioning, heating, stress... the list is endless. As we get older, oxygen levels in our skin cells start to naturally decrease, reducing the skin's elasticity, allowing fine lines and wrinkles to develop. Boost Oxygen Beauty enhances the available oxygen to the skin and contributes towards the repair and regeneration of collagen and elastin tissues in the body. It's natures best defence against signs of ageing. 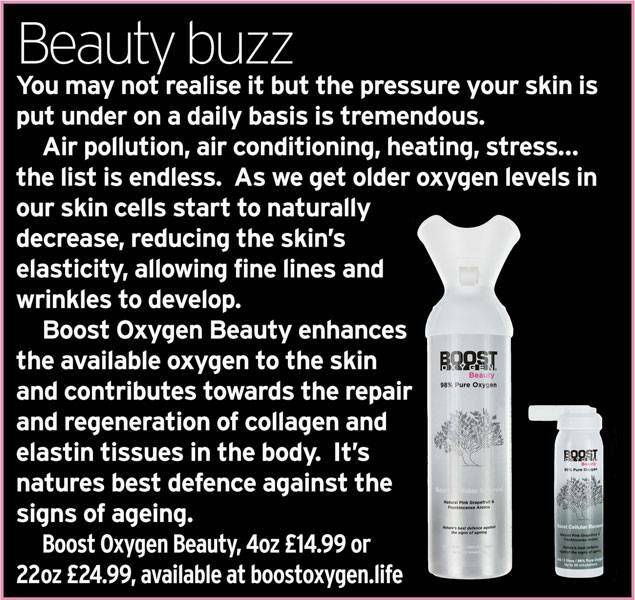 Boost Oxygen Beauty, 4oz £14.99 or 22oz £24.99, available at boostoxygen.life.